The Aviation Industry Corporation of China (AVIC) released a news on its official micro-blog account on June 11 that China's Y-20 heavy transport aircraft had conducted its first airborne jump and airdrop training jointly with airborne troops of the PLA Air Force in recent days. The news shows that the Y-20 may have had its first heavy equipment airdrop training, which is of great significance to the PLA airborne troops. Actually, the PLA Air Force's official micro-blog account had released a similar news on May 8. 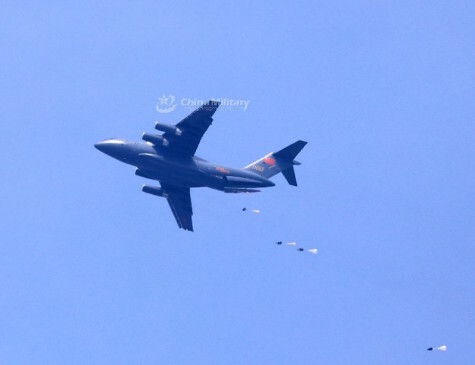 The only difference is that the photos released by the PLA Air Force were mainly about the parachute jump training, without any scene of heavy equipment airdrop, whereas those released by the AVIC clearly displayed the scenes of Y-20’s heavy equipment airdrop, which means that the Y-20 transport aircraft has basically passed the test of heavy equipment airdrop. Experts said that the Y-20’s completion of heavy equipment airdrop is of great significance to the improvement of the combat capability of China's airborne troops. Since they were created, the airborne troops have been a "trump card" that can quickly defeat the enemy and has also won countless honors. But due to limited parachuting technology and carrying platform, the airborne troops' firepower is usually inferior to other ground troops, and even weaker than standard infantry troops. Therefore, airdropping heavy equipment has become a key to improving the combat capability of airborne troops. Heavy equipment airdrop refers to airdropping heavy weapons and equipment over one ton. It is an essential guarantee for the remote maneuverability and fire assault capacity of modern airborne troops. Compared with the previous heavy equipment airdrop by IL-76 and Y-8 military transport aircraft, the Y-20 transport aircraft for this mission has the capacity of airdropping an eight-plus-ton ZBD-03 airborne armored infantry fighting vehicle (IFV). The advantage of the Y-20 is that it can carry multiple airborne combat vehicles or airdrop much heavier weapons and equipment. However, it still takes more tests and training to give full play to the Y-20's advantages in large cargo hold and large loading capacity.